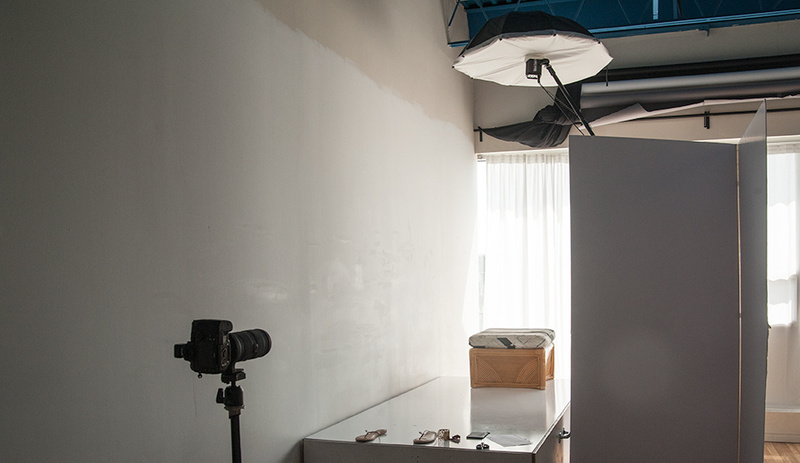 Shooting in a photography studio can seem a bit daunting. A lot of photographers choose to shoot outdoors due to budget constraints and the fear of stepping into a studio. There are, however, some real benefits to shooting in a studio and they apply to both new and experienced photographers. If you have not had a chance to try shooting in a studio I highly recommend the experience. 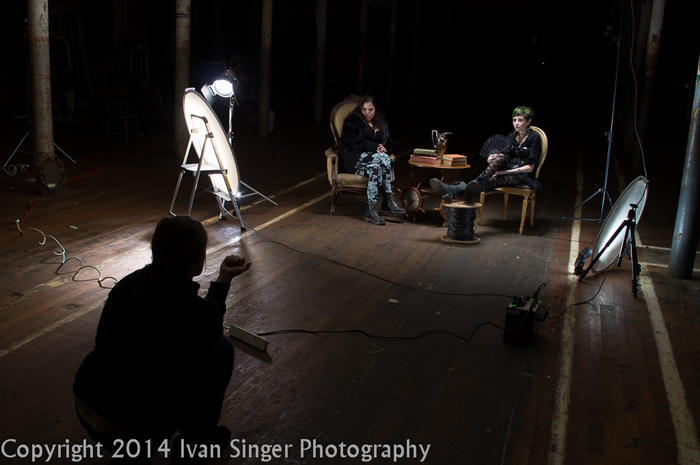 Don't get me wrong, the outdoors is great, but I am personally quite fond of shooting in a studio. A photo studio offers you certain amenities that you just can't get outdoors. Since not everyone can afford to own a studio outright, it makes all the more sense to simply rent one when you need it. Costs vary greatly from city to city, but you can usually find some affordable options. Furthermore, if you split the cost with your team, it can be far more affordable than you think. The biggest benefit of shooting in a rental studio as opposed to the outdoors is the control you have over every aspect of the production. Outdoors you have to worry about temperature, wind, rain, and every other environmental variable that could be tossed your way. Even the light can be unpredictable. It can change from hard to soft with the movement of clouds, and on longer sets you can even run out of usable daylight. When shooting in a studio you are sheltered from all those environmental variables and have full control. You can maintain consistency throughout your project, no matter how long it takes. Your light can remain identical from 6 a.m. all the way through to midnight if that is what it takes. You also have full control of your backgrounds and don't have to travel any distance to get from location to location. You simply tear down and build up each set right there on the spot. In the process you can add whatever elements you want. Usually on location you don't have that luxury. You shoot what is already there, but in a studio, you can create your own setting from scratch. Usually when photographers think about adding variety to their portfolio they immediately think of outdoor settings. Different locations give you different looks right? Well sure, but shooting in a studio does not have to mean being constrained to only shooting on seamless paper or other uninspired looks. Most studios contain a wide variety of props for you to use. You have all sorts of furniture such as stools, chairs, and even vintage pieces. There might be lamps, and fabrics, and desks for you to use. Some studios even have costumes, masks, and clothing. All these choices add up to an endless amount of possibilities that can create all sorts of images and styles. Part of the appeal in using a studio is understanding how to effectively use key elements to add texture, color, and composition to your images in a way that expresses whatever mood and idea you are after. You can completely fake an outdoor image by staging it in a clever way and shooting it in the studio. You don't have to travel enormous distances to exotic locations just to get the look and feel you are after in your portfolio. With a bit of imagination and some elbow grease you can put together a simple set that will translate all those same qualities of an exotic location, but all the while shot in the studio. Furthermore, most studios are equipped with professional gear and equipment. Under normal circumstances all this gear might be out of most photographers budgets, but studios usually rent out equipment for a small fee, which gives you that extra creative freedom to test out and play with all sorts of gear you might not normally have access to. There is also the benefit of not having to lug it around from location to location. You know what is not always so great? Mosquitos. You know what is great though? A private washroom! I don't mean to be facetious, but renting a studio for your production comes with some pretty great creature comforts. There is usually a kitchen where you can make coffee and reheat some food. Studios are usually located close to restaurants where food and drink is readily available. Most places are climate controlled too so you can dial in the exact temperature you want. Outdoors you may have to deal with hot humid conditions, or on the opposite end, bitter cold winds. There may not be any comfortable seating or any food nearby. You might have to trek through the woods for quite a while, where maybe you'll step in a puddle, and now you have wet shoes for the entire day. The bottom line is that renting a studio offers you a comfortable location where your mind can stay focused on producing quality work without any outside distractions. All members of the crew can stay comfortable the entire day. If you have not yet had any studio experience it can seem like a really intimidating environment. Most studio owners, however, are very experienced photographers and eager to help. They are there to answer questions and offer some guidance if you need it. 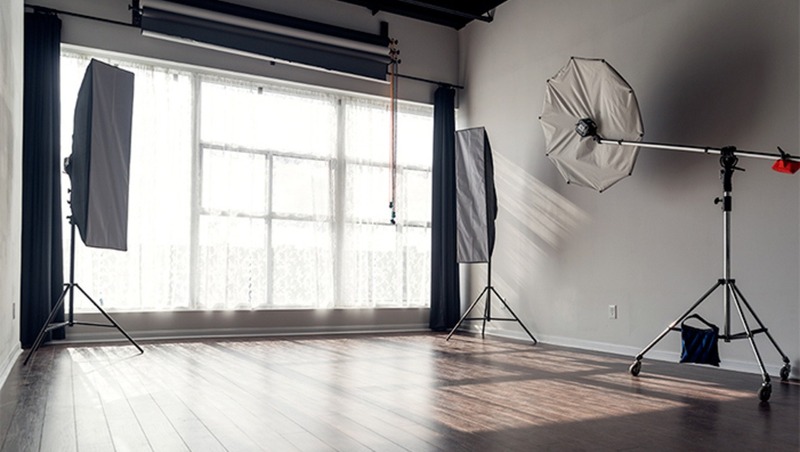 Renting a studio space can be just as much a learning experience as it is a space to create. Studio owners have a wealth of knowledge. They have seen just about everything. Photographers from all genres and experience levels bring with them bits and pieces of knowledge that the studio owner absorbs and learns over time through observing and having conversations. They pick up on various lighting techniques, tips and tricks of the trade, and even savvy business advice. Going to a studio can be your chance to strike up a conversation with the owner or the staff and pick their brains for some of this information. Most owners and staff are also on hand to help with using equipment. It can be a great way to receive a quick crash course about how to properly and effectively use various lights and modifiers. 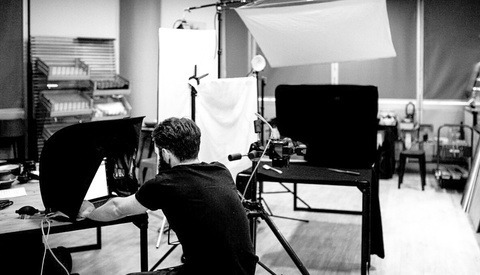 Shooting in a studio can be a great way to bounce around ideas with other creatives and get inspired for projects. I stopped using studios a few years ago after I was getting a lot of cancellations and no shows. This is frustrating enough when you're on location, but its an even bigger headache when you have a studio booked. I love shooting on location though. With the flakiness and unprofessional public we photographers deal with nowadays, I only book studio space when I have secured a deposit at least equal to the cost of studio rental. It also weeds out the wannabe models, so you don't waste your time preparing for a shoot. I've been there with models. Too many times. Such a pain!! This is meant to be a GENERAL COMMENT, the "You" referenced in the prose is not directed at anyone in particular. I'd go all proper and use "One" instead, but it's a Holiday. Flaking has less to do with the "unprofessional public" and far more to do with "unprofessional photographers." When I began photography in 1973, at age 18, my mentor, 69 year-old Master Craftsman Walter Thurston had already been a professional photographer with a very successful studio for 30 years, before I ever walked in the door. One of the very first things Walter taught me was, to be successful in photography and not have to have day jobs to support my art/craft, then I had to treat photography as a BUSINESS. Over the 40 years I have been licensed, bonded and eating food photography bought, I've recognized as many have that far more than many successful photographers are those with some degree of business background, be it education or business related success, prior to picking up a camera. In fact, decades ago one of my mentors told me, "If you want to be financially successful in photography, sell all of your cameras and go get a degree in business. Then you will understand marketing and the business of photography and your talent and skill will not go to waste." If photography is your hobby, defined by the IRS as a venture that fails to turn a profit three years in a row, then expect little from it outside of your own personal satisfaction, but if you intend to run a business based on your photography, then treat it like a business and that involves, a business model, structure, contracts, commitments and operating as a business. Operating as a business is actually a legal term. Most photographers don't know it, but when they make business cards and create a web page offering their services in exchange for dollars, they are "Operating as a business." When operating as a business, there are legal expectations. Failing to provide those expectations can lead to any number of legal issues, lawsuits and even criminal charges. When "operating as a business" a photographer is expected to provide a minimum industry standard of product and service. Yes! Your work will be compared on a legal merit to those in your area and/or market who produce similar industry standard works or service and if you fail to do so, you can open yourself up to, and here it comes... a word photographers cannot imagine applies to them, but it does... "MALPRACTICE!" Produce a wedding that a bride can show is below or less than minimal industry standards for your area and in court, you may come face to face with two legal liabilities. Breech of Contract and Malpractice. So, if your intentions are to be a PROFESSIONAL PHOTOGRAPHER, there are expectations to consider, one, be licensed and bonded... it's what serious professionals do. Make sure you have at least $1 million in Liability insurance to cover any accidents on-location or in the studio. Not only that, but you will need at least $1 million to get permits in many cities, towns, government properties and even the wide open Mojave Desert where the BLM demands you have a permit, pay a fee or pay a much larger fine. It's what photographers wearing Big Boy Pants do. They act/perform professionally! Want to stop FLAKING? Then conduct yourself as a business, not a friend, not a nice person doing someone a favor or someone having a blast with their HOBBY, but a PROFESSIONAL. If you order a light bulb from a lighting company, you have to pay for the bulb, before the company will order the bulb, because they as a business, generally with experience, know if you have nothing invested, you have no commitment to return for the bulb. Why? BECAUSE THAT IS HOW BUSINESS WORKS! If you order a custom wedding gown, you are going to pay either a 50% deposit and fill out a contract for the remaining balance upon delivery or you are going to pay the full price up front, then wait for your dress. Why? BECAUSE THAT IS HOW BUSINESS WORKS! Want your car repaired, your home AC repaired, your Dentist to work on your teeth, your architect to design your garage, your electrician to rewire your house, your plumber to replace your toilets... you are going to agree to a quote, then sign a contract and very likely pay a deposit. The contract is a binding agreement between TWO PARTIES, there is no such thing as a "UNILATERAL CONTRACT" where it benefits only one party. Or where only one party is bound. BOTH PARTIES ARE BOUND! In Nevada the contract law is described simply as, "If you ask a man to dig a hole for $1 and he agrees... there is a verbal binding contract. Once the man digs the hole, the $1 must be paid." If your photography is a hobby, then pay no attention to any of this. If your photography is a business, then BE PROFESSIONAL! Learn the ART, CRAFT, SCIENCE and BUSINESS OF PHOTOGRAPHY and RUN YOUR BUSINESS AS A BUSINESS and IN BUSINESS, contracts, deposits, commitments and repercussions are EXPECTED. What if you have a model fill out a commitment form and then she or he does not show? INVOICE THEM FOR THE COST OF THE SHOOT THAT INVOLVED THEM! If you accrued expenses for a photo shoot that revolved around the model, then that model should be responsible for reimbursing you for those costs. Someone will say, "There's no way to get the money!" That is because you do not know what you do not know. Send a letter of intent. Your intentions, if they do not pay within 120 days of the letter, then you will go down to the local court and pay $15 to file a LIEN UPON THEIR NAME. This means they cannot buy anything with a title, car or home etc. or sell anything they already own that has a title, car, home, real property until YOU GET PAID! Ninety-nine percent of the time, you never get as far as filing a lien. I've had one in the past 40 years of business. The letter of intent generally gets the job done. Why would you do such a thing? BECAUSE IT'S BUSINESS! RUN IT LIKE A BUSINESS! Or don't and keep working a day job the rest of your struggle to survive as a photographer. Over 40 years, I have always run my studios and location assignments as business dealings, complete with expectations, commitments, contracts, deposits and remedies. People don't often flake when it is going to cost them something. They are much more likely to flake when they feel no obligation to show up. OBLIGATION IS GOOD... It gives us a reason to write on calendars. Deserves a separate post on Fstoppers. 1) Consistency of look and vision - You cannot practice your professional studio techniques if you do not have easy and affordable access to studio space, learned independent of your client's time. That also includes controlling tones/reflections and backdrop colors, using specific props, and rigging. All of this has to be loaded in and out in time for your shoot and eats into your bottom line on the day of the shoot. 2) Expensive Studio Time - Nothing makes a client (or a photographer) more nervous in front of the camera than being "on the clock". 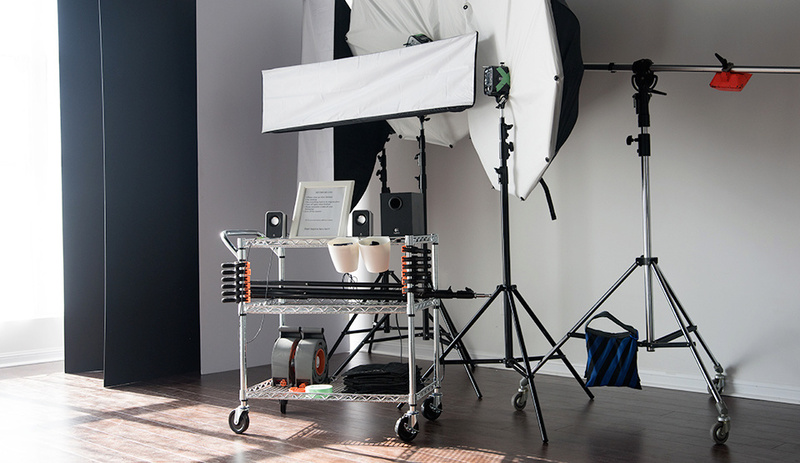 Even if you have purchased the rental studio for the whole day, your client, the stylist, your assistant(s), rental gear, etc. cost by the hour. Who needs that sort of pressure? Build your own studio and all of that stress is moot. I usually take my client out to lunch or dinner afterwards. Can't do that if you have to load out, and get the hell out of that rental space. 3) Your Space/Your Brand - A generic rental studio space, even a nice, well-appointed one does not reinforce your brand or your image as a professional to the client. One rental space I really liked (see shot below) was in an old mill building with the original floors and windows, but damn, if it didn't take an extra two hours to sweep up and wipe down all of the surfaces for my client. The client knows it's a rental space, what does that say about you and your rates? 4) Short window of time with the client - Even when your client(s) do show up, you may only have them for five minutes or less. Location photography looks like an awfully good option, then. Better have a few location techniques at the ready in case you have to come to them instead. In that case, you probably lost your deposit or the whole rental fee. I would love to have a space in my home, however I don't think my clients would like to come over to my place (home) and shoot an editorial or a look-book...along with my dog and girlfriend...not going to happen. I know for you the economics make sense, Hugh, but since I rented last in 2014 I moved into a bigger house with room for a studio for $200 a month more in a nicer neighborhood with real location options like green open spaces, forests, chapels . I made the complete studio investment back (including the rigging) in the 4 months between January and April. The studio is right past the front door and I painted ceiling and walls middle grey to reduce reflections and deepen shadows and textures. My studio lighting kit suspended by 2 sets of autopoles and extensions that run horizontally across, allowing me to suspend lighting directly overhead and on axis with the camera and model. I'm doing lighting setups now that I never was able to do before. And I can leave them up, tweak them, or break them down in minutes, not hours. Oh, and I have a dog and a girlfriend and four children. That's how it happens. Though I agree with all of your points, I think you should add in that there are a slew of downsides to having it in your home. First, your home needs to be in a nice neighborhood and look well cared for inside and out. Your entrance needs to look not only be clean but styled like a builders model home. You need to have your home smell nice - so no cooking before clients arrive. It needs to be quiet so no kid/kids running around. Once all of that is perfect, you also need to consider the financial risks. Your standard home owners will not cover a lot of walk through traffic. If someone trips and falls there is the legal question of are they going to sue your business or you personally or both - most likely both. I finally found a home owners, after calling every local insurance broker in my region. I said the number of clients coming to the house would not exceed an average of three a month and my insurance is triple what it would otherwise cost. Of course, you could skip the insurance and pray that nothing ever happens but that it a plan asking for trouble. I know that there are few good answers. Great article, thanks. I live in a city where I can't find a stdio to rent that is fairly close. I doubt that any of my clients would want to travel that far. My city has adopted a new policy where you need a permit to shoot in the city parks. I use to have a business where we went to out clients home. Some people wouldn't use us because we didn't have a studio and they didn't think we were legitimate. I want to do boudoir photography but I live in an apartment and I feel kind of sleazy having my clients go there. I've thought about renting a space for a studio and to help offset the cost I've thought about starting a co-op or renting out the studio to other photographers when it's not in use. This article and your website give lots of helpful information on how to do that. Thanks again. I shoot in a lot of different cities, rental spaces are great. I've actually shot a Peter House's studio and I'd recommend the space. Studios, like locations are mere tools. Use them as they best suit the task at hand. If they are not cost effective, then they should not be used. If they are cost effective, then they may be the right tool for the job. If they are required for control factors, then by all means use them, build them, rent them and bill the cost accordingly. If you are not billing your clients for studio rental fees when you are obligated to pay them... I suggest a college business course. Business is about MARGIN, not eating expenses. Uh, beg to differ. Websites, gear, software, techniques, those are tools and agree that you use them for the task at hand and easily replaced and improved upon. Your own studio space, like a carpenter's workshop, is NOT a tool; it is an investment that takes time to build. I grew up around painters, sculptors, and musicians and having a space to create in is a necessity, like air to breathe, not something you grab off the shelf to use. As I said, some should take a few courses on business. EVERYTHING YOU USE in your business is an expense and comes out of the money earned. You can either itemize the charges for what is used during a photo shoot as commercial clients are used to or you can build a percentage of each expenditure into the price you charge, but one way or the other, you are charging for every item you purchased to build, operate and maintain your photo business. A photographer who incurs expenses that are not recouped by receivables/fees billed to clients is going to suffer at some point. You can beg to differ all you want, BUSINESS IS BUSINESS and in business you charge fees to pay for not only the photos you take, but the equipment, the insurance, the light bill, the water bill, the rent, the background paper used, every light stand and camera. If you are not billing your client for those items INCLUDING THE STUDIO SPACE in the price and fees you are charging, then you are losing money. It's not an opinion. IT'S MATH! 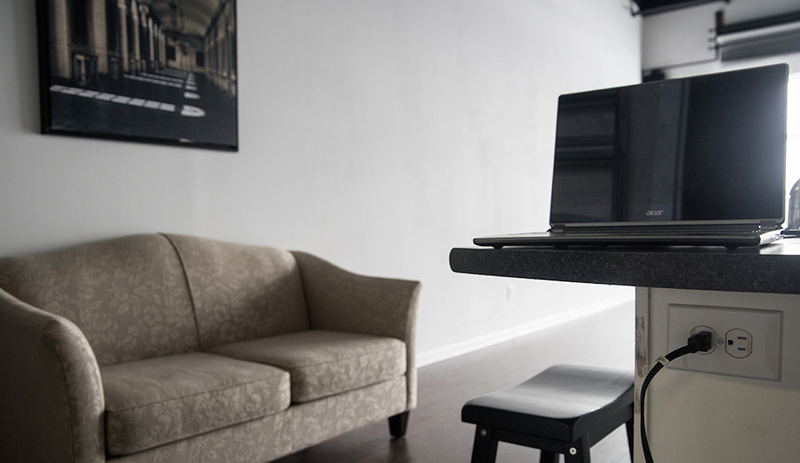 Your studio space has costs associated with every square foot of it. Not just to purchase, but to operate and maintain. I suggest a business course to help you understand that every square foot of your studio has a running cost to it. Casinos here in Vegas understand that... they pay a head counter to count heads every few hours. The person walks around with a clicker and every time they see a customer, they click the counter. The counter shows how many people are using the casino and that figure is counted as how many customers per square foot. They use that figure to evaluate their cost and profit potentials. If they don't have a certain number of heads per square foot... they go broke. If your studio, air conditioning, water bill, power bill, gas bill, is not being paid for and the head count relative to the square feet of your studio is not producing a positive cash flow, then you are going out of business. Whether you rent someone else's studio or rent your own, there are expenses involved that have to be recouped by units of sales with hopefully a margin of profit when it is all said and done. The REASON it is wise to charge for your equipment use is because THE EQUIPMENT DOES NOT LAST FOREVER and has to be replaced quite often. The studio space generates it's own costs that have to be recovered. I've said it a thousand times in the past 40 years... Photographers are their own worst enemies. Everybody is different. For some, having your own studio is a must; for others, it is not practical and for some it would not make any sense. e.g. if you have to shoot in another city/country or cannot have your own studio for any reason. In other professions, many people produce best when they telecommute and others cannot produce from home. Each person's situation is different. Therefore different options are available for different people. One business model does not work for everybody. I have a shoot coming soon. My client wants to shoot in a studio. Im going to have to book a studio. how much should i charge my client for me booking the studio? Josh, you can't be eating costs... that's not business that is charity, so you can either mark up the studio rental fee to make a few extra dollars if you choose to sell your photography and time at a budget price or... if you are charging your worth and have a healthy margin on your photography, as a selling point and symbol of courtesy, you could just pass on the ACTUAL studio rental fee, which can be seen as an honest and commendable offering by your clients. But, if you are passing on the cost without a mark up, be sure to mention to your clients that... "In most cases photographers mark up any third-party costs and pass those inflated costs on to the client, but we understand everyone likes to save money, so we help our clients save their hard-earned cash, by passing on the third-party studio rental costs and avoid tacking on any additional charges to the rental fee. We cannot give our services away for free, but we do strive to help our customers save money where we can, when we can." You do not have to GIVE your photography away to build a client base and a successful business and certainly you should have a healthy, profitable margin on your work, but you can stand out among the gaggle of photographers in your market, by sincerely caring about your customers and letting them know you are not there to milk them for every dollar they have. Treat them with respect and they will come back year after year and pay the fees you ask, without you having to say the words, "We are the cheapest in town!" NEVER BE THE CHEAPEST IN TOWN! That's like buying a fake Rolex. The only person fooled and impressed is YOU. A nice photo studio, i found a great photography backdrops website - Buy-backdrop.com, it's a heaven of backdrops.